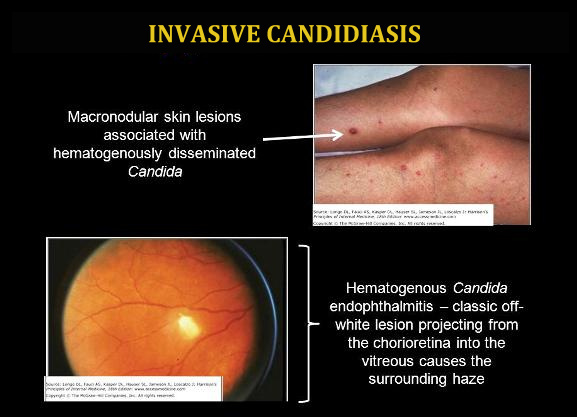 Invasive candidiasis is an infection caused by a yeast (a type of fungus) called Candida. Unlike Candida infections in the mouth and throat (also called "thrush") or vaginal "yeast infections", which are localized to one part of the body, invasive candidiasis is a serious infection that can affect the blood, heart, brain, eyes, bones, or other parts of the body. Candida normally lives in the gastrointestinal tract and on skin without causing any problems. However, in certain patients who are at risk, Candida can enter the bloodstream and cause an infection. A Candida bloodstream infection, which is the most common form of invasive candidiasis, is called candidemia. 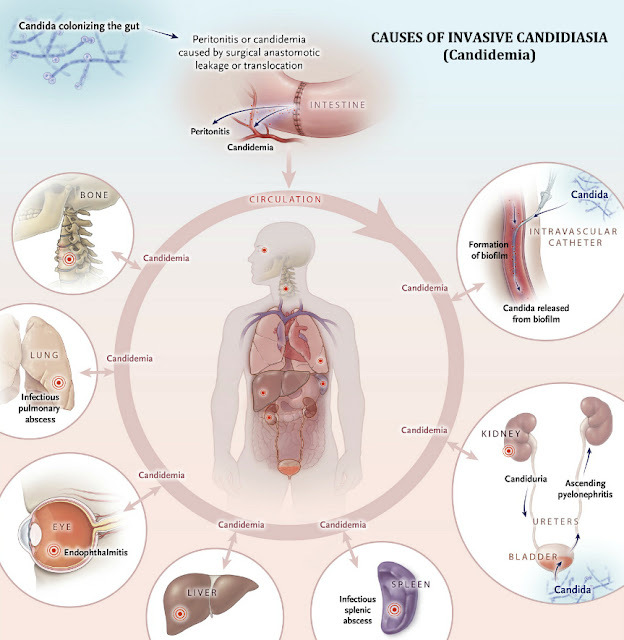 Candidemia is one of the most common causes of bloodstream infections in hospitalized patients and it often results in long hospital stays, high medical costs and poor outcomes. 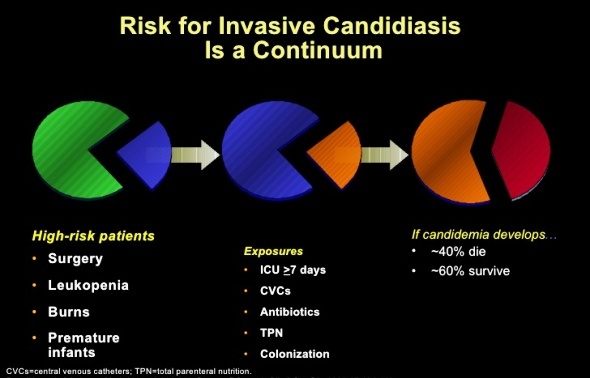 Invasive candidiasis can be treated with antifungal medication. Antifungal medication is often given to prevent the infection from developing in certain patient groups. Fever and chills are the most common symptoms of invasive candidiasis. People who develop invasive candidiasis are often already sick from other medical conditions, so it can be difficult to know which symptoms are related to a Candida infection. However, the most common symptoms of invasive candidiasis are fever and chills that don't improve after antibiotic treatment for suspected bacterial infections. Other symptoms can develop if the infection spreads to other parts of the body, such as the heart, brain, eyes, bones or joints. Healthcare providers rely on your medical history, symptoms, physical examinations, and laboratory tests to diagnose invasive candidiasis. The most common way that healthcare providers test for invasive candidiasis is by taking a blood sample and sending it to a laboratory to see if it will grow Candida in a culture. Results from a blood test will usually be available in a few days. Candida lives in and on the body. Candida, the fungus that causes invasive candidiasis, normally lives in the gastrointestinal tract and on skin without causing any problems. In people who are at higher risk for the infection, invasive candidiasis may occur when a person's own Candida yeasts enter the bloodstream, for example, where an intravenous (IV) catheter was inserted or during surgery. Medical equipment or devices, particularly intravenous catheters, can also become contaminated with Candida and allow the fungus to enter the bloodstream. Healthcare workers can also carry Candida on their hands. There have been a few outbreaks of candidemia linked to healthcare workers' hands, so hand hygiene in healthcare settings is important for preventing the spread of infections. There are over 150 species of Candida, but only about 15 of these are known to cause infections. The most common species that cause infections are C. albicans, C. glabrata, C. parapsilosis, C. tropicalis and C. krusei. The specific type and dose of antifungal medication used to treat invasive candidiasis usually depends on the patient's age, immune status, and location and severity of the infection. For most adults, the initial recommended antifungal treatment is an echinocandin (caspofungin, micafungin, or anidulafungin) given through the vein (intravenous or IV). Fluconazole, amphotericin B, and other antifungal medications may also be appropriate in certain situations. For candidemia, treatment should continue for 2 weeks after signs and symptoms have resolved and Candida yeasts are no longer in the bloodstream. Other forms of invasive candidiasis, such as infections in the bones, joints, heart, or central nervous system, usually need to be treated for a longer period of time.